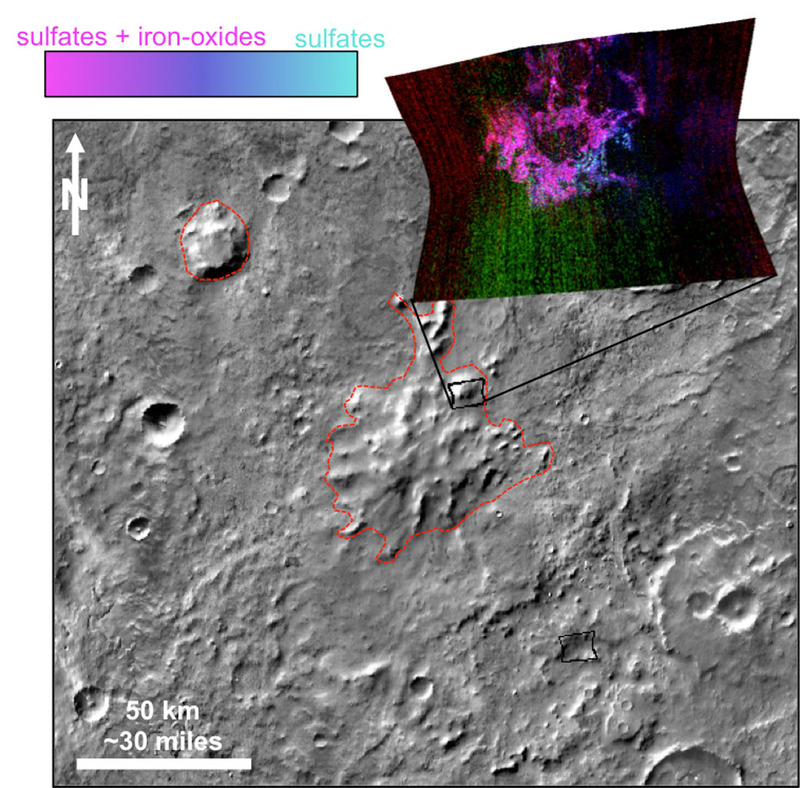 May 3, 2016 – Volcanoes erupted beneath an ice sheet on Mars billions of years ago, far from any ice sheet on the Red Planet today, new evidence from NASA’s Mars Reconnaissance Orbiter suggests. The research about these volcanoes helps show there was extensive ice on ancient Mars. It also adds information about an environment combining heat and moisture, which could have provided favorable conditions for microbial life. Sheridan Ackiss of Purdue University, West Lafayette, Indiana, and collaborators used the orbiter’s mineral-mapping spectrometer to investigate surface composition in an oddly textured region of southern Mars called “Sisyphi Montes.” The region is studded with flat-topped mountains. Other researchers previously noted these domes’ similarity in shape to volcanoes on Earth that erupted underneath ice. When a volcano begins erupting beneath a sheet of ice on Earth, the rapidly generated steam typically leads to explosions that punch through the ice and propel ash high into the sky. For example, the 2010 eruption of ice-covered Eyjafjallajökull in Iceland lofted ash that disrupted air travel across Europe for about a week. Characteristic minerals resulting from such subglacial volcanism on Earth include zeolites, sulfates and clays. Those are just what the new research has detected at some flat-topped mountains in the Sisyphi Montes region examined with the spacecraft’s Compact Reconnaissance Imaging Spectrometer for Mars (CRISM), providing resolution of about 60 feet (18 meters) per pixel. “We wouldn’t have been able to do this without the high resolution of CRISM,” Ackiss said. The Sisyphi Montes region extends from about 55 degrees to 75 degrees south latitude. Some of the sites that have shapes and compositions consistent with volcanic eruptions beneath an ice sheet are about 1,000 miles (about 1,600 kilometers) from the current south polar ice cap of Mars. The cap now has a diameter of about 220 miles (about 350 kilometers). The Mars Reconnaissance Orbiter Project has been using CRISM and five other instruments on the spacecraft to investigate Mars since 2006. The project is managed by NASA’s Jet Propulsion Laboratory, Pasadena, California, for the agency’s Science Mission Directorate, Washington. The Johns Hopkins University Applied Physics Laboratory in Laurel, Maryland, provided and operates CRISM. Lockheed Martin Space Systems in Denver built the orbiter and supports its operations. NASA has three active orbiters and two rovers at Mars that are advancing knowledge about the Red Planet that is useful in planning future missions that will take humans there.